I'm sure you've seen traders trade with a "naked" chart. Well, the answer is price action trading. And that's what you'll discover in today's training so you can also trade with a naked price chart to better time your entries and exits — without relying on any indicators. What is price action trading and how does it work? The first thing that I want to say is that when you're trading price action you need a framework. For example, you have a 3000 square feet land and you want to build a house for your family. I'm pretty sure that you wouldn't just randomly put random stuff on that piece of land, would you? What you'll do is that you will probably hire someone to plan it for you. "Hey, this is the house, this is where the house will be. This is where the toilet will be. This is where your garden will be. This is how many levels the house will likely have. This is where your bedroom will be." You want to have a blueprint in your hand to map out where the things should be at. Only then, when you follow the blueprint would you have a house that actually makes sense. This is the same for price action trading. You need to have a blueprint. A frame of reference that you can compare against and then form an educated trading decision. What is this framework or blueprint that I'm talking about? This is something called the four stages of the market. I first came across it by traders like Stan Weinstein, Richard Wyckoff, and earlier veteran traders. This is a concept that I learned from them. I still encourage you to watch it because I'm going to tackle it from a different light that you might not have understood before. An accumulation stage looks somewhat like a range. And the market doesn't go up forever. Short sellers will come in. This is where the seller has to control and push the price down lower. And the market doesn't go down forever. Eventually, you find the level of equilibrium before the buyers take control and push the price back up higher once again. So, it goes into an accumulation stage and then it makes an advancing stage once again. You can see that this is the cycle that the market typically goes through. Some of you might be thinking, "Hey Rayner, all this looks simple in hindsight. For example, this is a distribution stage but who is to say that the market can't break out higher?" The market can break out higher! But what you have in front of you is a frame of reference. Something that you can measure against! So, let me give you a few examples of how I'm going to use this framework to plan my trading decisions with zero indicators. What is this stage of the market? Chances are you'll say it's in an uptrend, an advancing stage. What is the one thing that you shouldn't be doing? You shouldn't be shorting this market! This means that you won't think of selling this market. You won't think of shorting. You will only find buying opportunities whenever you see a chart like this. Where can you buy on this chart? If you ask me, you can use the plain old vanilla support and resistance. Now, I know that this market is in an advancing stage. I know that this is a possible level that I can look to buy since it's in an uptrend or is in an advancing stage! Can you see what I'm trying to bring across? Classify the stage the market is in and then plan your trading decisions by using support and resistance (or even trendlines if you want to). If the market retests this trendline, I know it has the confluence of this area of support as well. And if you want to use indicators, that is fine as well. Using indicators are not bad. Indicators are only bad if you use them solely to rely on them for entries and exits. You can see that the market is respecting the 50 MA pretty nicely. So, these are all possible trading opportunities for you to get long in this advancing stage. Based on the four stages of the market you have learned earlier, what stage is Bitcoin in right now? I hope you said a declining stage, which is another word for a downtrend. In a downtrend, what is the one thing that you don't want to be doing? You don't want to be buying in a downtrend unless you are an investor or Warren Buffett. But if you are a trader, you don't want to be buying in a downtrend. Well, you want to be shorting! Now, you know what you should be doing. You should be shorting Bitcoin right now. The next question is, where do you want to short? Again, this is where just simple technical analysis could come into play. You can see that once you have classified a stage of the market that it's in. Then, you can formulate proper trading decisions that's according to the price action of the markets. Now, let me go into something a little bit more complex from here. If you look at this, what stage of the market is this in? This is where things get a little tricky because it might be in the accumulation stage. It might also be in a declining stage. But for me, I would classify this as an accumulation stage. This has not happened yet but it could possibly happen if you give it another few more weeks. This is a signal too that this market is potentially in an accumulation stage! If you know that this is possibly an accumulation stage because you also have a prior downtrend, what is the decision that you want to make? Where do you buy in such a market condition? I don't go into precise entries and exits because that is outside the scope of today's video. Today's video is just really training you to read the price action of the market. If the market breaks out, you can look to get on board the start of this new trend. This is another technique that you can use to trade if the market breaks out of this accumulation stage. And finally, another thing that you can do is let the market show its hand. Which could be like a bull flag pattern. All right, so let's move into something now a little bit more complex, shall we? Now, if you look at the chart, it's actually somewhat similar to soybean. This market previously has been in an uptrend, advancing stage. Now I won't confirm that this market is in a distribution stage! We are all dealing with probabilities whenever we are trading, not a certainty. However, you also know that if this is a potential distribution stage, then you should look for shorting opportunities. Now the question is where? If you are bearish and you think that this market is topping already given the fundamentals and economy and etc. Forms a buildup, and breaks down. If all of the above happens, reference the high as your stop loss in anticipation of a decline. The market comes up higher and gets rejected lower. If that happens you can just look to short on the false break. You can see that the false breaks somewhat gives you confirmation that the market isn't going to head higher any time soon. This is why the price got rejected and it closed back within the range. Similar as to what we've seen earlier on Bitcoin. One thing to share is that the four stages of the market appear on different timeframes. The only difference is that the magnitude of the move is different. The higher timeframe move naturally lasts longer. This market is actually forming a head and shoulders pattern. Now, how do we know that this could possibly be a distribution stage? Remember the clue I said earlier, multiple timeframes. You'll notice that this market is actually coming into an area of resistance on the daily timeframe! This has a pretty high probability of the market actually now heading down lower and then moving into a declining stage! 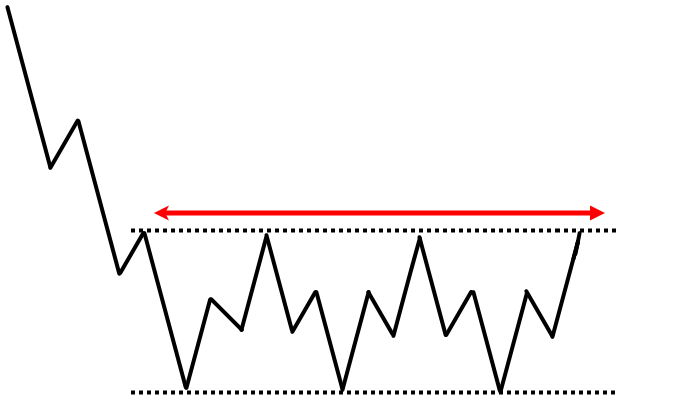 An Accumulation stage is when the market goes into a range (in a downtrend). If it breaks down, the downtrend is likely to continue. But if it breaks out higher, it's a start of the Advancing stage. An Advancing stage is when the market is in an uptrend — you want to look for buying opportunities. 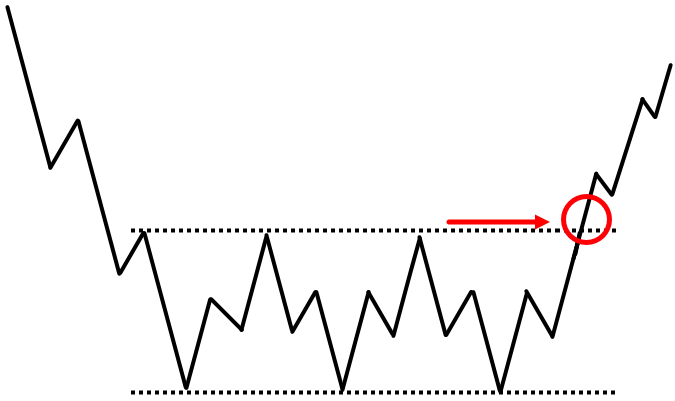 A Distribution stage is when the market goes into a range (in an uptrend). If it breaks out higher, the uptrend is likely to continue. But if it breaks down, it's the start of a declining stage.